An artist's rendition of mastodons, camels and a ground sloth before the environmental changes of the Younger Dryas led to their extinction. Credit: Barry Roal Carlsen, University of Wisconsin. For the first time, a dramatic climate shift that has long fascinated scientists has been linked to the impact in Quebec of an asteroid or comet, Dartmouth researchers and their colleagues report in a new study funded by the National Science Foundation. The event took place about 12,900 years ago, at the beginning of the Younger Dryas period, and marks an abrupt global change to a colder, dryer climate, with far-reaching effects on both animals and humans, the scientists say. 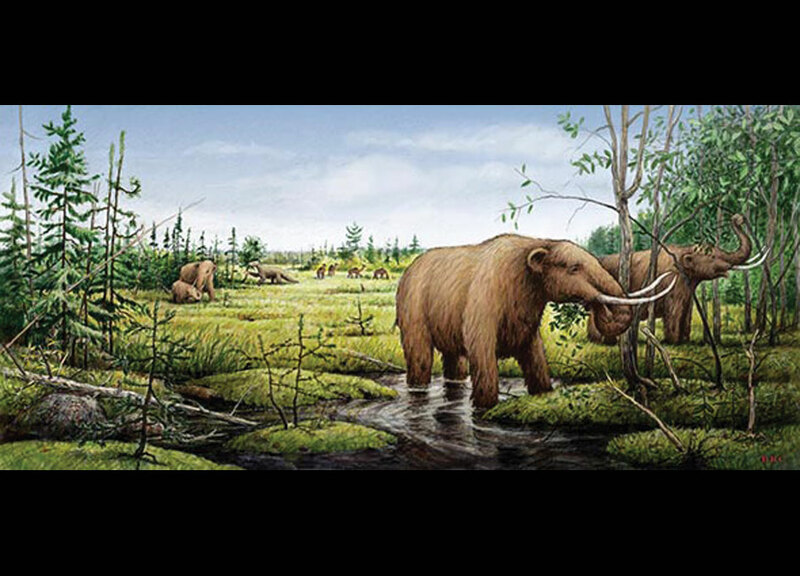 In North America the big animals, including mastodons, camels, giant ground sloths, and saber-toothed cats, all vanished. Their human hunters, known to archaeologists as the Clovis people, set aside their heavy-duty spears and turned to a hunter-gatherer subsistence diet of roots, berries, and smaller game. That these powerful environmental changes occurred is not in dispute, but there has been controversy over why they happened. 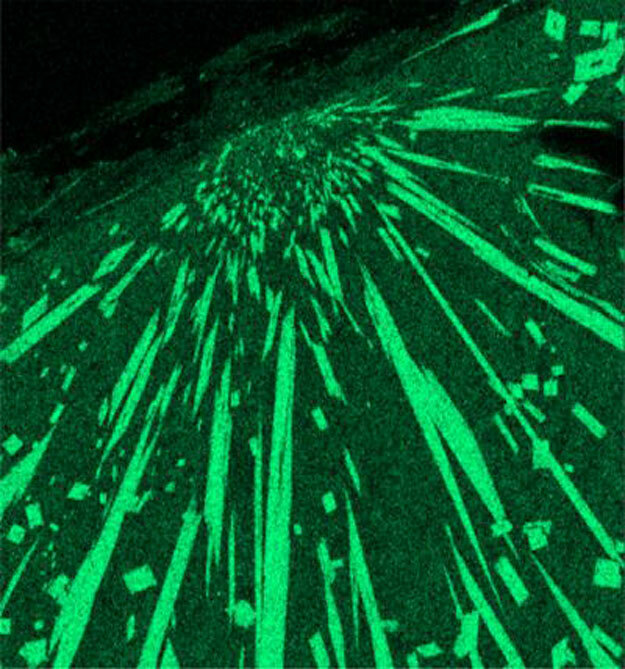 The new PNAS paper focuses on one cause: a comet or meteor striking the Earth. The classical view of the Younger Dryas cooling interlude has been that a surge of meltwater from the North American ice sheet was behind it all. According to this theory, a large quantity of fresh water accumulated behind an ice dam. The dam suddenly ruptured and dumped all this water into the Atlantic Ocean. The sudden influx is thought to have shut down the ocean currents that move tropical water northward, resulting in the cold, dry climate of the Younger Dryas. 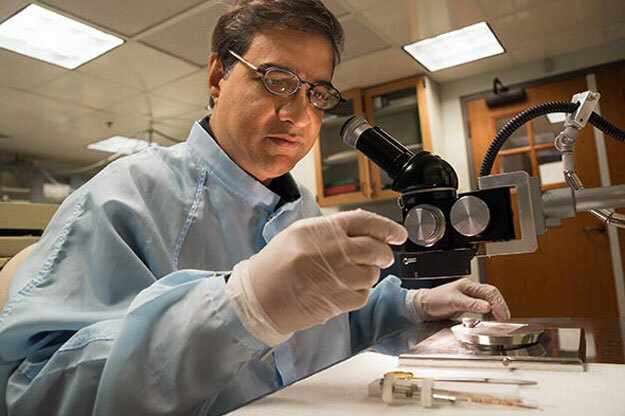 Using a binocular microscope, Dartmouth geochemist Mukul Sharma examines impact-derived spherules that he and his colleagues regard as evidence of a climate-altering meteor or comet impact 12,900 years ago. Credit: Eli Burakian. However, Sharma and his colleagues from Dartmouth and other institutions have discovered conclusive evidence linking an extraterrestrial impact with this environmental transformation. The PNAS paper presents a scenario in which a meteor or a comet collided with the Earth. The report focuses on spherules, droplets of solidified molten rock expelled by the impact. The spherules in question were recovered from Younger Dryas boundary layers at sites in Pennsylvania and New Jersey, the layers having been deposited at the beginning of the period. The geochemistry and mineralogy profiles of the spherules are identical to rock found in southern Quebec, where Sharma and his colleagues say the impact took place. “What is exciting in our paper is that we have for the first time narrowed down the region where a Younger Dryas impact did take place,” says Sharma, “even though we have not yet found its crater.” There is a known impact crater in Quebec–the 4-kilometer-wide Corossal crater. However, based on mineralogical and geochemical studies, it is not the impact source for the material found in Pennsylvania and New Jersey. The high temperatures of the meteorite impact 12,900 years ago produced mm-sized spherules of melted glass with the mullite and corundum crystal structure shown here. Credit: Mukul Sharma.